Barron Collier chose the pioneer settlement of Everglade, with a population of less than twelve families, as the hub of his sprawling Southwest Florida development – a tropical wilderness as large as the state of Delaware. The town was renamed Everglades and became the first County seat when Collier County was created in 1923. 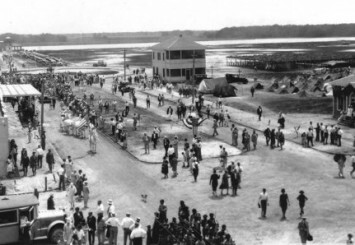 Although few believed it was possible at the time, Collier launched an ambitious building plan to bring new growth and development to the Southwest Florida frontier. Backed by Collier’s personal fortune, extraordinary care went into planning every detail for transforming the town of Everglades into a modern 1920s community. An army of surveyors, engineers and architects went to work laying out new docks, buildings, streets and railroads. New homes were built to fit a particular site and uniformly painted a deep cream color with green or dull red roofs, giving Everglades a military or “company town” appearance. Before long, Collier had provided residents with electric power, telephones and running water, regular mail delivery, railroad, trolley and steamship service, a two-room schoolhouse, clinic, courthouse, fire department, gasoline station, movie theater, a weekly newspaper, a well-stocked department store, and even a 45-room hotel managed by a top Bavarian chef. The Bank of Everglades, the first bank in the area, opened just two days after Collier County was created, on July 9, 1923. The town officially became the City of Everglades on June 30, 1953. © 2019 Collier County Museums. All rights reserved. Collier County Museums are operated by the Board of County Commissioners for Collier County, FL. For more information, visit www.CollierCountyFL.gov.